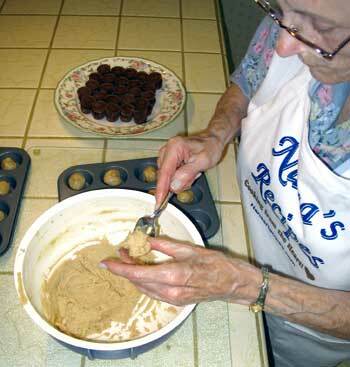 Find the complete recipe for Reese's Peanut Butter Cookies recipe on the Chocolate Cookies page. 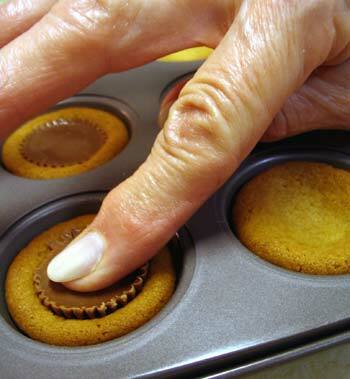 Drop dough balls from a teaspoon into the miniature muffin pan. Larger balls produce a softer cookie. Smaller balls result in a crispier cookie. 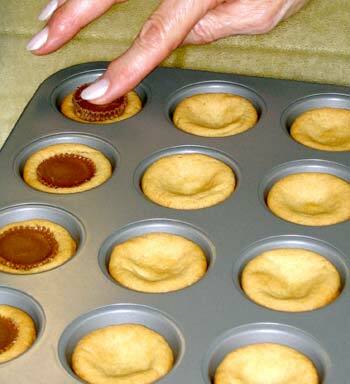 After baking, press an unwrapped Reese's Peanut Butter Cup into the center of each cookie. Notice how the cookies already have an indentation making them ready to accept the cup. Here's a close-up shot of the insertion of the peanut butter cup. Push the cup into the dough until it's even with the surface of the cookie and only the top is visible.